Its about Flicka's foal, Thunderhead. An all-white foal who is always getting into trouble...Thunderhead, when given his head, can fly as though winged, so Ken decides to enter Thunderhead in some horse races. But it becomes clear that Thunderhead can fly only if he's free. I remember reading this book many years ago. This is actually the 4th in the series. There are 3 movies before it (Flicka, Flicka2 friends forever and Flicka3 best friends). I have all three at home and watched thunderhead online. I loved the book Thunderhead. I have a copy of it at my parents. I think it was my mom and aunt's when they were little. I haven't been able to find the movie but if it's half as good as the book is then it will be worth the search. Book is quite old. don't know if you could get the original. Our library has it ,but it's a small library. I loved the movie thunderhead and i want to know what website i can watch green grass of wyoming. can anyone tell me where to read the thunderhead book??????????? thanks. Really great! But I feel sorry for the guy when thunderhead goes nuts in the race! This is the second movie of the Flicka series!I've rented it at blockbuster and I give it 5 stars!It starts when Flicka has a grey foal and the boy finds Flicka and her foal.I think a year later Goblin a.k.a. Thunderhead is as wild as ever!But the bot is determined to train him to be a champion racer!That's all I will tell for now!Have fun watching! I so want to see this movie.What is it like?Is it good is it awesome between those? This movie is awesome!! I think it's a continuation from My Friend Flicka?? i loved the movie flika can anyone tell me where i can find the movie thunderhead son of flika?????????????????????????????? 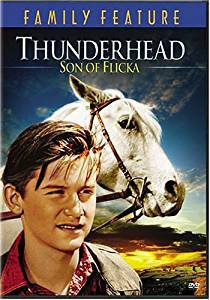 Note from Sydney: You can get Thunderhead - Son of Flicka from Amazon!